Fibromyalgia is one of the fastest-growing diagnoses in the country. Yet, it’s also one of the most controversial diagnoses; many doctors deny its existence, while others use fibromyalgia as a fallback when they are unable to determine the actual cause of ill health. 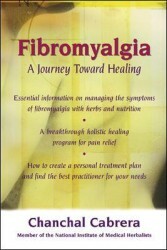 Fibromyalgia: A Journey Toward Healing offers hope and help to the 6 million people who suffer from this condition. With its holistic approach, it shows how patients can achieve lasting wellness and healing through changes in diet and lifestyle and by using herbs. Numerous self-help remedies as well as advice on exercise, physical therapy, and aromatherapy are presented. As Chanchal tells the story of her own struggles with the condition, so she explores practical strategies for healing and being well. For orders outside of North America please call 250 336-8767. You may purchase the book with or without the DVD by calling 250 336-8767.